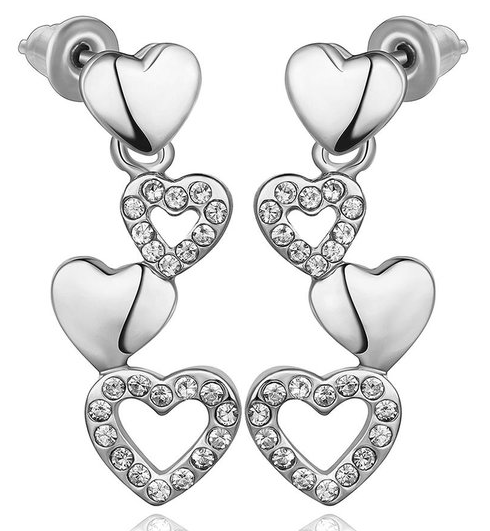 18K White Gold Quad Hearts Drop Down Earrings Made With Swarovksi Elements Only $7.99! Down From $199.99! Ships FREE! You are here: Home / Great Deals / 18K White Gold Quad Hearts Drop Down Earrings Made With Swarovksi Elements Only $7.99! Down From $199.99! Ships FREE! Tanga has these 18K White Gold Quad Hearts Drop Down Earrings Made With Swarovksi Elements on sale for $7.99 (Reg. $199.99)! Spoil yourself or someone you know.This beautiful irresistible Earring is for any occasion and sure to get a lot of attention!Wear it everyday as your staple accessory or save it for a special night out. The beauty of this necklace is that you can dress it up or down—so hurry up and add this must-have piece to your core accessory collection!